Our primary measurement of our camp programs is through successful completion of the program (final performance) and through both student and parent surveys at the end of the program. Students report learning the following things during their Camp experience: self-control, problem solving, making new friends, how to stage a play, Shakespeare, discipline, punctuality, history of England, physicalization of characters, importance of listening, stage combat, how to connect to other people, acting techniques, voice projection, and breathing. Since 2007, the Festival does pre- and post-testing for all Camp participants in order to measure the effectiveness in meeting our goals of increasing student’s understanding of the art of theatre and increasing their understanding of Shakespeare and the history of the times in which he worked. Results from last year show that students’ knowledge increased on average by 38%. As evidenced in parent/guardian and camper comments, Camp Shakespeare programs teach Shakespeare and so much more. When asked about our education programs, 92% of parents saw high levels of growth in their child in the areas of self-expression, confidence and participation with new friends and success in their child’s knowledge of theatre and William Shakespeare. 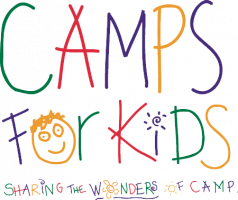 In order to be eligible to be matched, gifts must be charitable donations made to Camps For Kids and must be received by Camps For Kids between April 1st and July 31st. Single contributions are only matched up to $1,500.